The first appealing thing about lemon rice is the lovely fresh yellow colour and secondly it definitely the taste. Eat it alone, hot or cold, have it with sambhar or yogurt it tastes yum. 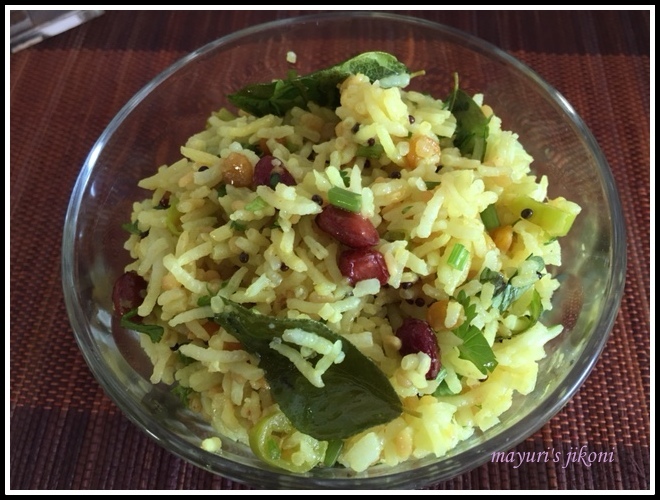 A good way to create a new dish with leftover rice. Simple ingredients make it tasty. However, I cooked the rice specially for this dish. A few days ago I had guests over for dinner. I made idli sambhar and wanted something simple to accompany it just in case someone felt unsatisfied with just idlis. I usually find that any type of rice dish acts as a filler when in doubt. Not only did they like the idli sambhar but also loved the rice. Heat oil in a wide pan over low heat. Roast the peanuts stirring them constantly till they turn light pink in colour. Add mustard seeds, red chillis, chana dal, urad dal and saute till the lentils turn light brown in colour. Add the curry leaves, ginger and green chilli paste. Saute for a few minutes. Add asafoetida and turmeric powder. Mix and immediately add the rice. Add salt and lemon juice and mix thoroughly but gently. Take the pan off the heat once the rice becomes hot. While cooking the rice, add a tbsp of ghee, a few cloves, whole pepper and a stick of cinnamon to get a good aroma from the rice. Add cashew nuts instead of peanuts or add both. Adjust the amount of lemon juice and chillis according to your taste.